This project was an hourly commission. The client had harvested an apple tree that had grown in the back yard of his home on 6th Street for over 100 years. 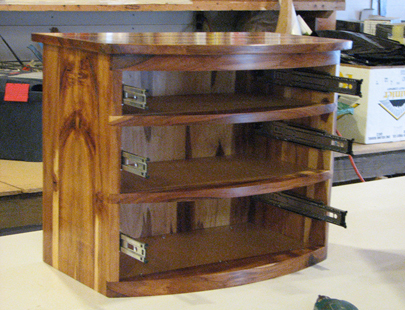 He asked that I make two matching cabinets, one for each of his children, who had grown up playing under that very tree. The design was up to me. The wood had air-dried for two years in an unheated storage space, constrained by spacers and nylon straps. I joined it, planed it, made a careful inventory and then strapped it with spacers to the rafters of the shop for another year of slow drying. 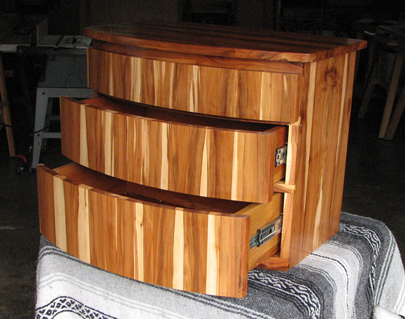 Using the inventory to maximize the yield, I completed and presented the design, two matching chests of drawers suitable for a dresser top in a bedroom. He approved, we reviewed several construction details, and the deal was struck. The chief technical challenge of the project was the curved vertical grain drawer faces. I began by making a large press out of multiple layers of 1” high-density particle board, cut individually to the proper radius on a band saw and then glued into two large blocks and sanded smooth. Six layers of 1/8” Italian Poplar bender plywood and resorcinol glue were then squeezed into this mold and allowed to dry, trimmed and then cut into the six drawer fronts. 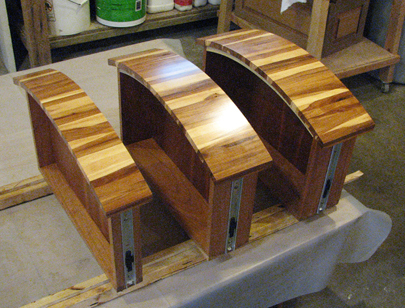 The inside face of the coopered apple panel had to fit perfectly over the outside face of these curved drawer fronts. Each cabinet contains 118 screws. 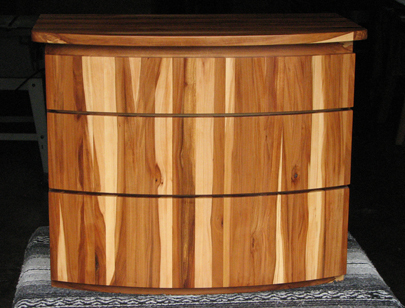 Each dovetailed drawer fits into its own chamber. The self-closing full-extension 10 inch drawer guides are rated to 60 pounds. 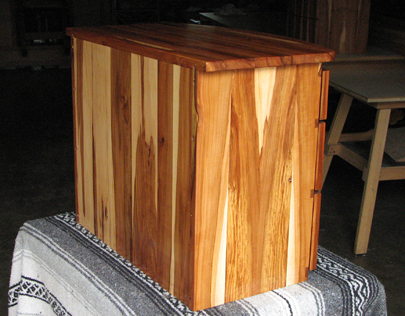 The finish is Danish oil under carnauba wax, brought to a high sheen with a wool buffer. 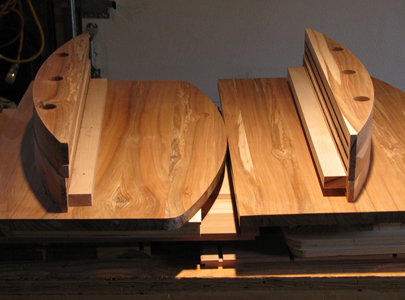 Apple wood is heavy, waxy and lovely. It machines easily and is a stable and obedient wood when properly dried.